Eglise et Monastère de Sao Bento, Rio de Janeiro is part of the Tentative list of Brazil in order to qualify for inclusion in the World Heritage List. Made a quick stop here while in downtown Rio (it's not far from the Valongo Wharf WHS). It's the strangest approach to a monastery as access is by elevator from a modern building on the street below (addresses are for that building if taking an uber or taxi) and the security guy points you in the right direction. The monastery is free though only the small church is open to the public. The exterior is simple and would never suggest one of the most ornate interiors I've ever seen. Despite its smallish size you could spend a long time in there trying to pick out every detail. Although it's on a hill in the middle of the city, there are no views and it was surprisingly quiet and peaceful. 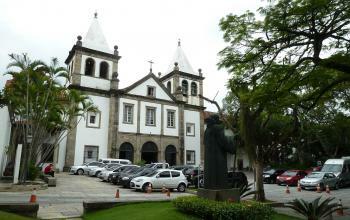 As this is not difficult to get to, it is a worthwhile quick stop while collecting the other sites of Rio. When we visited in June 2015 the monastery was undergoing extensive restoration, with the church interior almost completely hidden by scaffolding. Sadly the ornate baroque interior is the defining feature of this monastery. So I don't really have a huge amount to say. The exterior is fairly nice, and the whole complex, despite sitting on top of a hill, is hidden from the bustle of downtown Rio. The glimpses of gold decoration and writhing statues certainly seemed impressive, and the pictures of the interior offered ideas about how awesome it will look when uncovered. We had a walk around several other ornate Portuguese baroque churches nearby to get our fill of gold studded gloom, so we had some consolation. The monastery has sat on Brazil's T-list for quite a while so I'm not really sure if it will ever move towards inscription, but perhaps this current restoration is part of the preparation for a potential listing. Downtown Rio isn't included in the already inscribed cultural landscape, and seems to be somewhat overlooked in favour of the more known charms of the southern beaches, however I rather enjoyed my slow morning walking around and having a languorous breakfast at Confiteria Colombo. There are a further two other sites within walking distance on the t-list so perhaps this corner of the city will become a real South American hotspot.